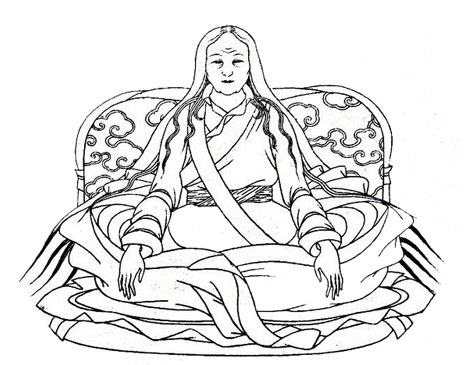 Ayu Khandro was a famous female Tibetan Buddhist. Her main practice was Chöd. 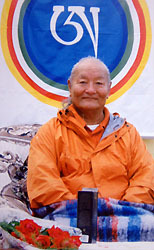 He is a Dzogchen master who has been teaching in the west for many years. This is a very short extract of some pieces I found interesting in that account. The whole account is here. When we entered Khadro’s room for the first time, only one butter lamp was lit. She was 113 at that time, but she did not look particularly ancient. She had very long hair that reached her knees. It was black at the tips and white at the roots. Her hands looked like the hands of a young woman. She wore a dark-red dress and a meditation belt over her left shoulder. During our visit we requested teachings, but she kept saying that she was no one special and had no qualifications to teach. From that day on, every morning she gave teachings including the practices of the subtle nerves and the subtle breath. In the afternoon at the end of her meditation session, she gave further explanation of the Chod of Machig Lapdron. This was the Chod practice she had done for many years when she was younger. In the seventh month on the tenth day, she gave the Vajra Yogini in the Sharpa tradition, the instruction I had requested, followed by a complete explanation. ….I was not with her a long time, a little more than two months. During that time she [gave] eight kinds of teachings and was really so kind and gentle. I had been betrothed against my will to Apho Tsenga’ s son. I had no idea, really, what it meant, but I understood an interruption to my practice was being planned. “The wedding took place towards the middle of the summer. It was a very happy occasion; even Togden Rangrig came to the wedding and showered blessings on us. It seemed as if we would be happy. “I stayed for three years with the Gara Tsong family, and my husband, Apho Wangdo, was very kind and generous. Then I fell ill and slowly weakened for two years. The sickness could not be diagnosed. Sometimes it seemed like a prana disease, at other times I had convulsions like epilepsy; sometimes it seemed like a circulation problem. I became worse and worse and was near to death …. “My husband was a very kind man and agreed that if married life was endangering my life, it must be stopped. I told him that if he genuinely understood and loved me, he would let me be free to go and do as I pleased. I also told him that I would welcome his assistance in my retreat and hoped we could have a relationship of spiritual brothers and sisters, and if he agreed, perhaps I would get better. After a while I began to get better. “When I was thirty, in the Year of the Earth Dragon, I began to travel around practicing Chod. “When we arrived at Dzog Chen monastery, winter was approaching, and it was becoming colder every day. Lhawang Gonpo taught me the inner heat practice and the practice of living on air and mineral substances, and so, thanks to his skillful instructions, I was able to live there quite comfortably in the bitter cold winter. We visited many lamas and other teachers at Dzog Chen monastery, and it was during this winter that I met my friend who was the same age as me, a nun called Tema Yangkyi. We became dose friends and traveled together for years. “I stayed the night there. I felt very sad and did some practice. The next day I went down the mountain a bit to the cemetery to stay and do Chod. The following .morning, I had a vision when I was between sleeping and waking of an egg-shaped rock in Dzongtsa, which I could enter through a cave. When I got inside, there was a very intense darkness which suddenly was illuminated by multi-colored light streaming out of it. This illuminated the cave and pierced the walls so that I could see through to the outside. “Then I awoke, and seeing this as a good indication and (since I’d heard there was in fact such a place), I left for Dzongtsa. When I arrived I found the place. It was near Dzongtsa, but was on the opposite side of the river from where I was. I decided to camp on a nearby hill and wait for some help or for the river to go down so I could cross. But it was autumn and the river was very high. “I practiced day and night, and during the third night, after midnight, something inexplicable happened to me. I had fallen asleep and a long bridge appeared. It was white and reached the other shore near the rock I had dreamed of. I thought, ‘Good, finally I can cross the river: So I crossed, and when I awoke I was actually on the other side of the river. “I had arrived but I did not know how. “In late autumn, an epidemic broke out among the nomad’s animals. I was asked to intervene, which I did with the Chod and fire practice. The epidemic stopped and everyone began to say I was a great practitioner. As they began to honor me, I was worried remembering that Trulzhi Rinpoche had said this was a demonic interruption. So I entered a stricter retreat. After a month or so, my former husband arrived with his second wife and daughter. He had heard of my arrival and brought me many supplies. We had a very good rapport; I gave him teachings, and he asked if he might build me a house. “So in the Year of the Wood Bird, 1885, in the first month on the day of the dakini I began a seven-year retreat. From the beginning I spent most of my time doing the practice in the dark. At first this was sometimes difficult so I alternated the dark and light, but the majority of the time was spent in complete darkness.